Yesterday one of our Account Managers took a call from another satisfied client. 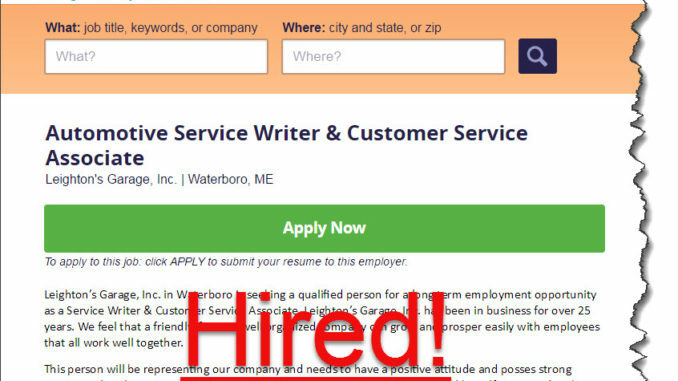 A local garage in Waterville, Maine posted an ad for Automotive Service Writer & Customer Service Associate on our JobsInME site. They also posted the same job on Indeed, our biggest competitor. Check out the results. 20 applicants from Indeed no quality. 3 from us and making an offer that was accepted. Results like this prove that bigger is not necessarily better when it comes to recruiting online. Our competition may have millions of users but WE have the right amount of LOCAL candidates they just can’t touch. They bigger they get, the more relevant we become. That’s why local job boards do it better. Three cheers for local recruiting, three cheers for JobsInME!